This project actually became 3 websites as the management team acquired additional certifications as capital managers. 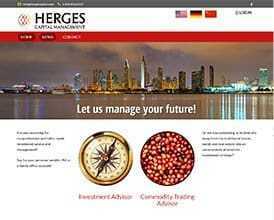 There is the main corporate site, the commodity trading advisor’s site and the investment advisor’s site. The sites are also available in English, German and Chinese. Flags at the top of the page allow the user to instantly access the content in the other languages.